We’ve just returned from eight days in Mexico City, and boy, are our legs tired. No, we didn’t walk from there, on a variation of the ancient joke. We just walked around there, miles a day, it seemed. I ought to be losing weight here in Mexico, but I think in the battle between More Exercise and Lots of Cheese, the cheese is winning. We got to the city last Friday evening after a full day: April 30 is Día del Niño here, and it was fiesta time at the munchkin’s school. You know it’s going to be a good day at school when you have to bring your bathing suit and some people are asked to bring popcorn for the potluck lunch. When I picked her up, she was clutching cotton candy. (She didn’t like it all that much–for all her sweet tooth, she usually only likes a few bites of candy or cookies and then declares herself done. I, on the other hand, can eat a pound of sugar without breaking a sweat.) There were Día del Niño festivities all over town in the afternoon, but we needed to be on a 3 p.m. bus: fortunately, a few hours’ celebration is as much as the munchkin needs or wants. It was also the last day of my one-month semi-intensive Spanish class and I had an exam all morning. I get motion sickness easily, and buses are the worst culprits, so I was braced for a bad four hours’ trip, but a dose of Bonine did the trick, and I was actually able to look out the window and enjoy the Mexican countryside, instead of huddling in my seat whimpering. The bus had individual movie screens. The munchkin watched half an hour of The Simpsons Movie before we realized she was watching in Spanish. I don’t think she noticed; she even laughed at the repeat of a line she’d found funny when we’d watched it in English a couple of weeks earlier. Saturday morning, I slept in while Joy and the munchkin went in search of a stroller. We don’t have one in San Miguel, where distances are short and the streets and sidewalks are too rough for a stroller anyway, but we knew we’d have very short days exploring the third-largest city in the world if we could only walk as far as the munchkin could manage, so we needed one. The neighborhood Sanborn’s, the Mexico City department store chain that seems to own a piece of every block there, didn’t carry any, so I’m sorry to say we gave our 400 pesos to Wal-mart. The air was visibly brown with smog in places, as in Los Angeles or (shhh . . . I’m not supposed to admit this) the San Francisco Peninsula, but it’s improved dramatically. Joy said that on a previous visit, she couldn’t see from one side of the Zócalo (city square) to the other. She also read that the prevalence of respiratory illness in the city’s kids is 50%, but at least you can see the National Palace from the other side of the square nowadays, so let’s hope the asthma rate will decline along with the smog. When we visited the Zócalo itself later in the week, I found it a bit disappointing, as I’d expected a green plaza something like San Miguel’s Jardin but dozens of times bigger. In Mexico City, it’s just a big paved space. This week it had lots of tents set up by unions who had taken May Day as an opportunity to tell Calderón to get the hell out. As of a week later, he’d declined to do so. Anyway, we didn’t go to the Zócalo on Saturday. We went to San Angel, a southern neighborhood with a Saturday artisans’ market, but ran out of steam before we saw much of interest there. It seemed a lot hotter in Mexico City–probably an illusion created by the fact that in San Miguel, we tend to hole up for the hottest hours of the day, not walk around sightseeing–and the air and altitude took some adjusting to. After perusing enough seriously bad painting at the market, we headed to nearby Coyoacán, which was a small town near Mexico City at the time Frida Kahlo was growing up there and has now been enveloped so that it’s a nice neighborhood within the city. We wanted to go to the Blue House, where she lived in childhood and for most of her adulthood as well. But it was closed. Those of you who have been paying more attention than we were will know why: yo, it was May Day. I don’t know if most museums in Mexico are closed that day, or just the ones devoted to Communist artists, but in any case, the Blue House was out. We strolled around the town square and the bazaar instead, the latter delighting me with the extremely detailed receipt I got on the way into the bathroom. 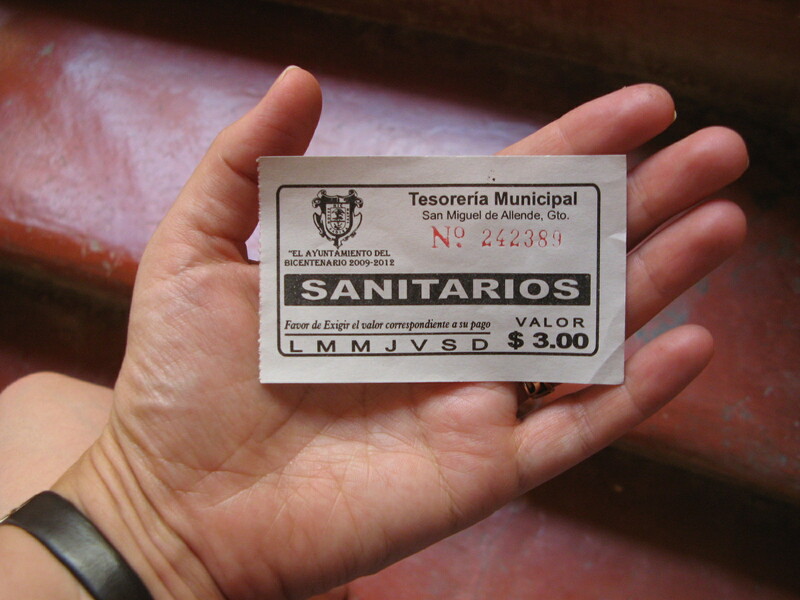 Public bathrooms in Mexico (the country, not just the city) are often managed like this: you pay 3-4 pesos to enter, and are given toilet paper by the custodian, whose job is also to keep the place clean and supplied with soap and such, and whose salary is presumably derived from the entrance fee. A fair exchange; I’ve been to plenty of public bathrooms elsewhere where I’d have happily paid 30 cents for the guarantee of cleanliness. 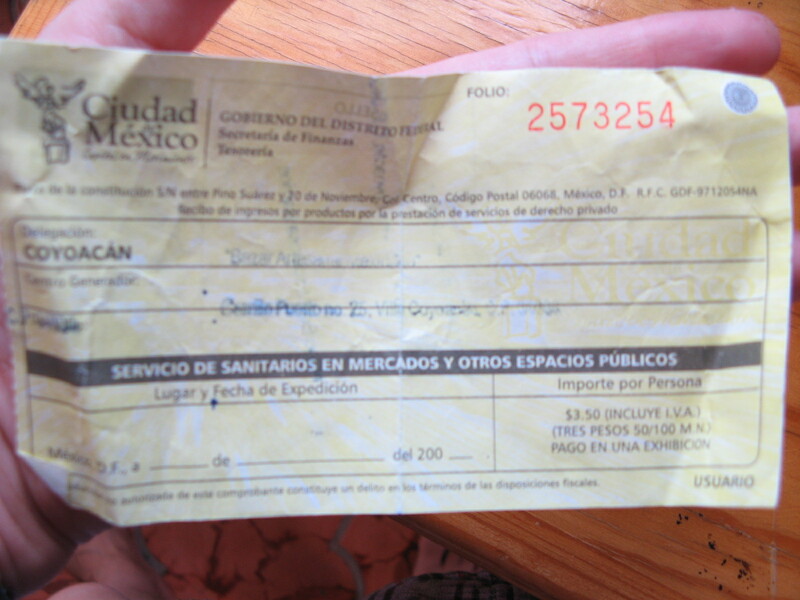 But I almost fell over laughing at the playground in San Miguel when the lady gave me a receipt tucked into my toilet paper. What, was someone going to be perched inside the bathroom door, checking that no one had slipped into the three-foot gap between the bathroom lady and the door without a receipt? Or was I supposed to hold onto it for a tax deduction? I held onto it for documentation of the joys of life in San Miguel instead. I guess I’m grateful they didn’t punch the day of the week, though it appears that they’re intended to. After seeing the Coyoacán receipt, I understood some point to having one: it’s documentation, not for the user, but for the vendor. 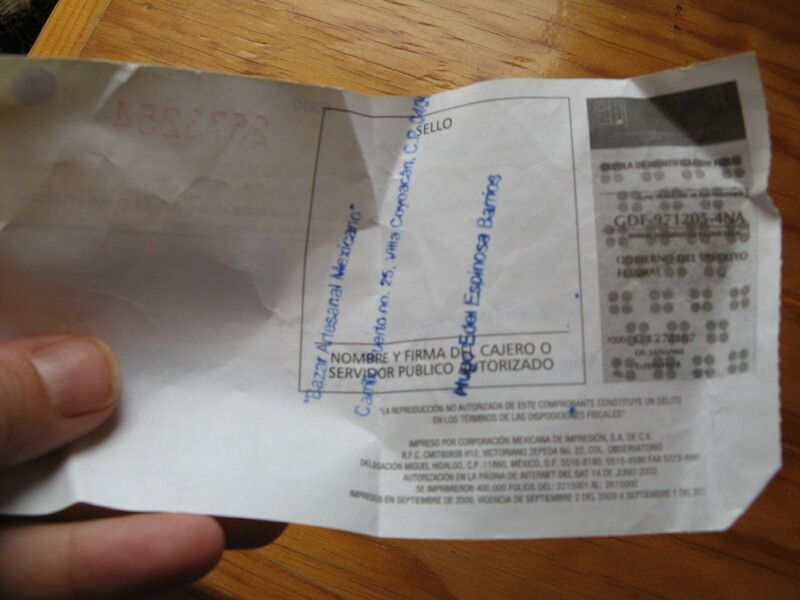 But it still cracked me up to see this level of detail on a receipt for a 3 1/2 peso trip to the facilities. One more note on this topic: In Mexico City, the bathroom doors, in place of damas/caballeros or mujeres/hombres, are occasionally labeled with a fan for women and a pipe for men. Maybe the fan is for waving away the pipe smoke. Anyway, I was very happy to be in the city. Even staying in a not particularly picturesque neighborhood downtown, I loved just walking around looking at the old buildings. A lot of the city was built during the long reign of Porfirio Díaz, whose dictatorial ways finally sparked the Revolution in 1910, but who built the modern infrastructure of the country. He was a francophile (he went into exile in France), and “porfiriano” architecture is often in a French baroque style you can’t miss. I prefer the less frilly facades, but I love all the variety of old buildings with new businesses in them, as in New York, and the proliferation of fountains, monuments, and modern sculptures.